Semiconductors were one of last year’s best performing industries as global growth propelled a surge in computational investment by firms worldwide. Semiconductor firms, as seen in the iShares PHLX Semiconductor ETF (SOXX) gained over 42% in 2017 but have struggled to continue their strength into this year. As the SOXX reaches its 2018 resistance zone for the fourth time this year, we believe the industry is a good short opportunity for a trader willing to manage the risk. From first glance, the information looks good. While an average PE ratio of about 27 is extremely high. Given earnings growth expectations of 45%, the valuation seems reasonable. Further, these firms did achieve a very impressive average earnings growth of 155% last year following a 24% rise in top-line revenue. However, with expectations so high, if revenue and earnings forecasts fail to meet the current estimates, a quick 30-50% drop in SOXX could occur as valuations return to comparable standards. We expect these earnings forecasts will greatly surprise to the downside in coming weeks. Revenue gains across the semiconductor industry were largely caused by a surge in demand for crypto-currency mining and a small rise in real Chinese economic demand. As you can see, there is a direct relationship between the price of bitcoin and the value of GPUs. Since the value of any GPU is tied to the value of any other product a chip-maker can produce, it is likely that last year’s surge in revenue for chip producers was largely due to crypto mining demand. 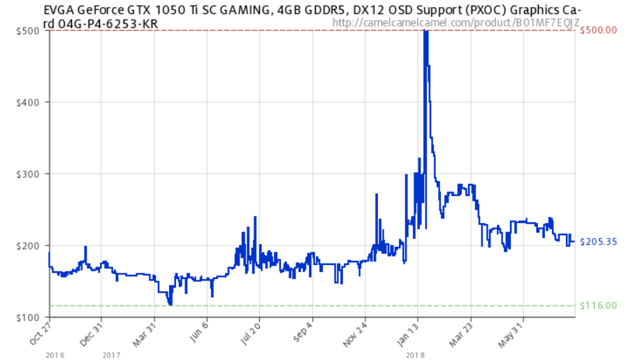 As you can see, prices have fallen over 50% for this product and we see a similar pattern of price declines in other major AMD and NVIDIA GPUs. Thus, we believe it is highly likely the next earnings report set for semiconductors will surprise to the downside and continue to fall. Prices remained high for most chips until late spring, after which they fell greatly. Investors in semiconductor stocks have not appeared to have fully priced this into their earnings expectations of these companies. Many analysts will cite AMD’s (AMD) recent earnings report that caused the stock to rally 14% in a single day late last month as a reason to believe crypto losses have not become a major risk to semiconductors. However, their strong earnings report was largely due to a one-off event of their new “Ryzen” card performing better than expected. In their earnings report, the firm announced they believe 6% of their revenue is from crypto mining demand. We estimate the figure is closer to 15-20% after knock-on effects are taken into account. While crypto-miners may only represent 6% of their revenue, a rise in prices in one GPU crypto-miners buy forces non-miner buyers of that GPU to purchase other cards, raising prices for cards across the board. Thus, we expect revenue to miss estimates for most semiconductors this quarter and in quarters to come as a reversal of those knock-on price hikes come to bear. To take a more concrete look at what should occur to these firms given a revenue decline, we will take a close look at our financial efficiency data for those top ten firms. As you can see, firms have been managing extremely high net margin levels. We expect revenue to rise for the sector at a maximum of 10% this year; so, for firms to achieve earnings growth of the expected 45%, continued increases to margins must be achieved. The typical firm takes home over 20% of its revenue in free cash that may be distributed to investors. That said, if revenue fails to rise or falls as much as we expect, it could easily cause the earnings of these firms to fall well above 50%. As seen in the changes to gross margins above, few of these companies were able to lower their cost of production last year. In fact, most of them saw a greater than 3% rise in production costs (TSM should be disregarded). Since global production costs continue to rise, we expect these firms to have lower earnings one year from now than they did one year ago before the craze for GPUs began. We have found the key to success in short-selling an ETF is to do it A) at a good price point and B) with the earnings calendar in mind, and C) in-line with fundamentals. SOXX has again returned to near its current resistance zone but is looking extremely choppy and indeterminant. This is good for us, as it provides a clue the market is currently in a state of stress before earnings reports come out next week. We find it unlikely for SOXX to break above the 195 level. To paint a picture of earnings report dates, next Thursday, both Applied Materials (AMAT) and NVIDIA will release earnings. The following Thursday, Broadcom (AVGO) will announce. Similar to Microchip Technology (MCHP) today (which is currently down over 7% after hours), we expect all of these earnings reports to miss top-line estimates. Now, they may not be a large miss as we expect the real declines in GPU and memory chips to accelerate into the fall and hit Q3 earnings reports hard. That said, we believe it is currently a proper time to turn bearish on semiconductors. Our thesis is contingent on a single belief, that cryptocurrency mania has come to an end and will soon hit chip makers where it hurts. We are bearish (though hold no position) on the crypto-market simply because it “seems like a bubble”. If coin prices return in-force, the prices of chips are likely to skyrocket again and cause a continued surge in sales for these firms. Further, we appear to be in a general technology bubble with many large and established firms maintaining PE ratios greater than 50. Thus, even if sales fall and earnings tumble, it is possible this market is so irrational that it won’t hurt chip stocks as much as it should. Since we believe that level of irrationality has come to an end, this seems to be less of a risk today than it was last year. However, one should only short this fund if they are ready to exit the positions on a moment’s notice. For us, that is if the ETF crosses above $195 decisively. Overall, we see a great short opportunity built up in semiconductors. Last year, sentiment and expectations rose to astronomical levels. Per usual, investors expect extremely high earnings growth to last indefinitely. What we believe they fail to realize is that gains were largely due to demand cryptocurrency mining. While miners may have only contributed marginally to sales, they were the “marginal buyer” who caused prices to rise to where they are today. Since the demand for computer products rose last year as well, chip buyers were willing to buy at such levels. Today, the story is far different. Crypto mania seems to have faded and thus, prices have begun to fall at an accelerating pace. We believe this will cause 30-50% downside for semiconductor stocks. We see most losses occurring in (MU), NVDA, and AMD as they rose the most last year, but we will focus mostly on SOXX to diversify our bet. Disclosure: I am/we are short AMD, NVDA.